I did it myself. Now, how about you? When something is beautiful, it simply is. 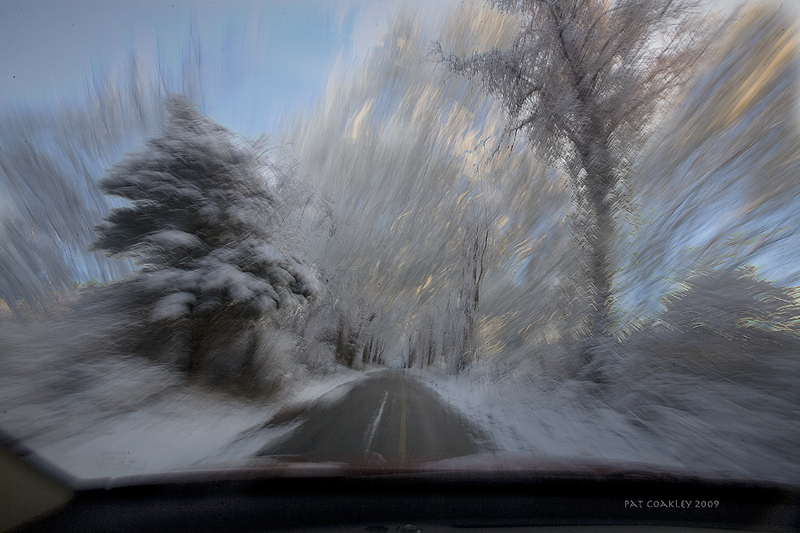 When the snow sticks, this is your road–and you better arrive early before the sun or wind makes it all disappear. But, when something else that begins with an “s” sticks, it never goes away. Really nice shot. I’m glad to be able to see such things vicariously rather than actually have to drive through it myself. Do you have snow in Oz, Razz? I’m probably showing my ignorance with this question but why start covering up now? very ethreal. We’ll get “treated” to some of this tonight and tommorrow. lol. Renee, the first snow storm is always a “treat”…by the time the 9th and 10th come? Not so much of a treat except to a photographer. Pat – this reminds me of Narnia with a car. You could call it CARnia! I love CARnia, Epic! Maybe I’ll rename my gallery on my website, http://www.patcoakley.com, that!! Although, I’m taking video tutorial lessons on how to name things so the search engines will find it and something as creative as CARnia may not make the cut! Damnation. Oh, I love this! The various blurs are like slip sliding, wind blowing, with a sparkle here and there and the sunlight just coming through behind to touch the treetops. O, thanks, Don! I’m a lovin’ this image, too, I have to say. I was trying to think how to market my images like this..for my “commercial” (stop laughing) website, patcoakley.com, and all I can think of is most of these images would look great on book covers or CD or DVD covers (they still make those right?! )…Anyway, I put this image on the front page of the Behind the Wheel gallery.